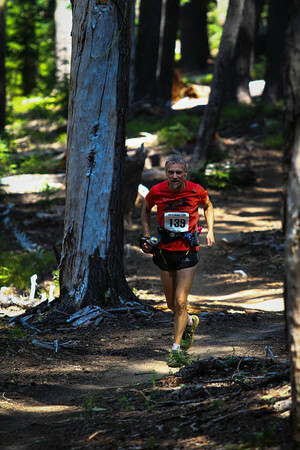 In its twelfth year, the Waldo 100k is the brainchild of Craig Thornley and Curt Ringstad. Upon Curt’s retirement in 2010 and for the past 3 years, I have had the privilege of being the assistant RD to Craig and will now be taking over as RD in 2014 as Craig steps down to assume his new role as the RD for the Western States 100. I decided it was time to step up and keep this small yet flourishing race alive because I have a deep attachment. It was my first trail 100k. It takes place in a beautiful, remote mountain and lake setting. It is comprised almost entirely of single track. And it is so well organized and executed that all I had to do was manage my effort and enjoy the fruits of the many volunteers’ labor. That experience is one I want to continue to be able to share with others. In what I took as a good omen, the 2013 Waldo 100k went off without a hitch–good weather, seasoned volunteers, and well-prepared athletes resulted in 108 finishers out of 137 starters giving us a 79% finishing rate. The women’s field was elevated with last minute entrant Caren Spore, running her first long race in about 3 years, joining defending champion and course record holder, Joelle Vaught. On the men’s side we had Jesse Haynes, fresh off a 7th place finish at Western States 100, returning to face relative newcomer and recent Chuckanut 50K course record winner Dave Laney, Marc Laveson from San Francisco, and 17 year old local phenom Andrew Miller. Also on tap was RD Craig’s bro, Chris Thornley, up for his 10th finish – only the second runner to have the chance to achieve this milestone. At 3:00 a.m., we sent off the early starters–reserved for runners for whom a 9:00 p.m. finish and the coveted finisher hat would be less possible without a head start. At 5:00 a.m., our more competitive field headed up in the darkness out of Willamette Pass. Dawn was just breaking as they arrived at the first aid station, with Jesse, Marc, and Dave running together. The women were more spread out, with Joelle in first followed shortly by Caren. At the end of the first big climb, Marc and Joelle would bag the men’s and women’s “Found Waldo” award which goes to the first runner to reach the summit of Fuji Mountain (13.7 miles into the race) where Waldo Lake can be seen for the first time. By the next aid station at Mt Ray (mile 20), Dave had started to gap the field, a trend that he would continue throughout the day, rushing through aid stations like a marathoner. Joelle maintained a lead over Caren, with both ladies looking cool and collected. At mile 37, Joelle had her biggest lead of the day at nine minutes, but by mile 45 her lead was reduced to five minutes, and in the next four miles Caren would overtake Joelle before the last hard climb up Maiden Peak. Caren continued to widen the lead to the win in a time of 11:07 to Joelle’s 11:28. Meanwhile, from Charlton Lake (mile 32) to 4290 AS (mile 37) Dave was running a minute per mile faster than Dave Mackey did in his 2011 record setting year, and his lead over Jesse increased to 43 minutes at mile 45. He was on pace to break nine hours, but the wheels came off in the last few miles. He ultimately finished in a time of 9:05:42, breaking Mackey’s record (9:06:51) by just over one minute. Jesse finished 40 minutes behind in a time of 9:45:14. Wet Waldo, the award to the first finisher to completely submerge in up to six named lakes, went to Rick Kneedler, in a time of 12:11, second only to Lewis Taylor’s record time of 11:44 from 2009. Show Us Your Waldo, a subjective spirit-type award that is judged by the aid stations, went to last year’s winner, Melissa Berman for her impression of “Alice in Waldo-Land”. Chris Thornley got his 10th finish, and our youngest finisher, Andrew Miller, came in an impressive 5th place overall in 10:05. I would like to thank all the runners and volunteers who participated in this year’s race, and invite everyone to join me as I take over the reins in 2014. 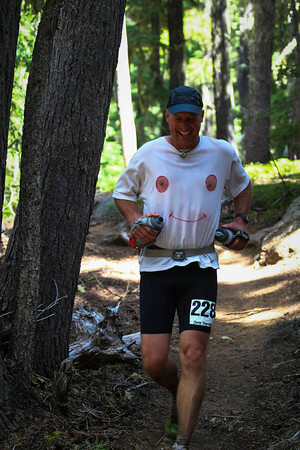 Waldo is organized to provide a quality ultra marathon experience, support the Willamette Pass Ski Patrol and other worthy service organizations, and steward the Pacific Crest Trail and other trails in the Willamette and Deschutes National Forests.